Kaskaskia has had a long, curious, and unusually mobile history. 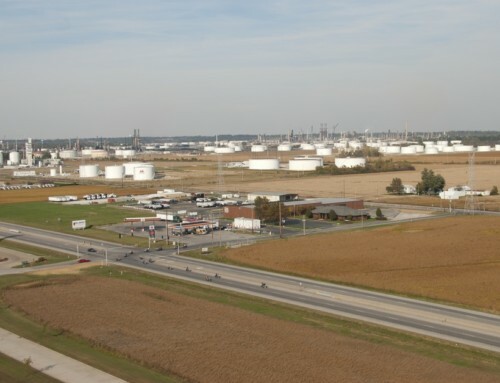 The community called Kaskaskia has been located in six different places. The first one—which was a community of Illini Indians—was founded on the upper reaches of the Illinois River in 1673, near the present town of Utica. In 1691, it moved about fifty miles downriver, close to what is now Peoria. By 1700, the village was moved again but much further south, to where the River Des Peres meets the Mississippi at St. Louis. Three years later, they moved south again to the west bank of the Kaskaskia (formerly known as the Metchigamia) River about four miles from its confluence with the Mississippi, to join a small community of Indians, French traders, and their families. This is the beginning of the community that most people think of when they think of Kaskaskia. In 1719, most of the American Indians moved further up the Kaskaskia River and started a new village because they thought the old village was becoming overrun with French settlers. Their new home was sometimes called Indian Kaskaskia; it remained an active community until the 1790s. In December 1718, the area’s new commandant arrived, Pierre Boisbriant, with a hundred soldiers and a support team. Boisbriant got to work building Fort de Chartres and asserting control over Kaskaskians. It was a prosperous period for the village, as it grew into the breadbasket for lower Louisiana (including New Orleans) and also profited from nearby mining (lead). By 1720, there were already 80 houses in the village. The city thrived, catching the attention of King Louis XV. In 1741, he donated a church bell to the town, in recognition of its prosperity. That bell would toll from the tower of the Church of the Immaculate Conception until 1873. The boom years under French rule ended around 1763, when France lost a war to England and ceded the Illinois territory to the British. A lot of French families didn’t want to see what life would be like under British rule, so they left. About 50 families moved from Kaskaskia to little village called St. Louis. Those who moved may have had the right idea. The village didn’t do well during the years of British governance, as there wasn’t much governance. The population fell, and the economy tanked; those who remained had a hard time making a living. On July 4, 1778, George Rogers Clark led a surprise attack on the village with 175 soldiers. They didn’t meet much resistance, because the French and Indian residents of the area had no desire to fight on behalf of the British. In the aftermath, though, civil control in Kaskaskia was nearly absent, so the region descended into lawlessness. Theft, assault, and murder became common. It wasn’t until nearly a decade later that Kaskaskia quieted down. When the US created the Northwest Territory in 1787, Kaskaskia fell under its jurisdiction. The Territory banned slavery, though, so slave-owners moved across the river to Sainte Genevieve, New Madrid, and St. Louis. By then, French influence was in sharp decline. In the decade of the 1780s, the number of French households dropped from 194 to 44 and continued to fall after that. As late as 1800, the village was mostly a collection of single-story frame buildings; the lone brick structure had been built in 1750. The village did well in the early part of the 19th century, with its population peaking between 1810 and 1820 around a thousand people. Farms were doing well, and the village was the center of government for the region. Kaskaskia served as the capital of Illinois Territory from 1809 to 1818, and as the seat of Randolph County from 1795 to 1848. Shadrach Bond, the first governor of the newly-minted State of Illinois, was a resident of Kaskaskia. Kaskaskians had better luck building a government than bridges, though. In 1824, a new bridge opened across the Kaskaskia River, but it washed out a couple of years later. Construction started on another bridge in 1840, but it collapsed before it was finished. Ultimately, the village’s location low in the floodplain would be its undoing. Major floods in 1766 and 1785 had damaged the town around the edges, but the big flood of 1844 convinced many people that the village didn’t have a bright future. 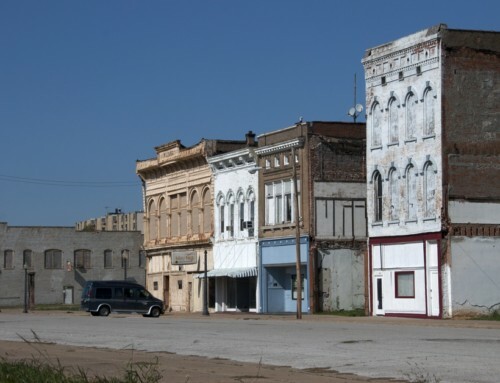 The town’s population fell below 500 as folks moved to places like Chester, Illinois, and Sainte Genevieve, Missouri. By 1894 what was left of the town had to be abandoned. The cemetery was relocated atop Garrison Hill. The old church was razed before the river took it. 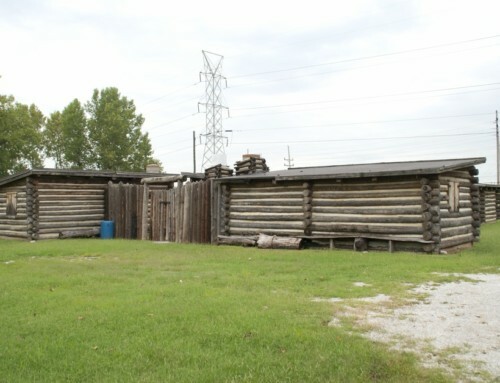 Kaskaskians laid out a new village about 2 1/2 miles south—the sixth site for Kaskaskia—and moved a few buildings there. In 1900, the village’s population was down to 170, with a few stragglers still living at the old village site. What was left of the old village washed away in the next few years. The new location hasn’t really proven to be much better. Kaskaskia took another big hit after the 1993 flood, with many of the remaining residents deciding that they’d had enough. Kaskaskia today is even smaller than a hundred years ago; in fact, it’s hard to image it getting much smaller. In 2010, the village’s official population was just fourteen. There’s not much left of the old village of Kaskaskia, and what remains is only accessible from Missouri. 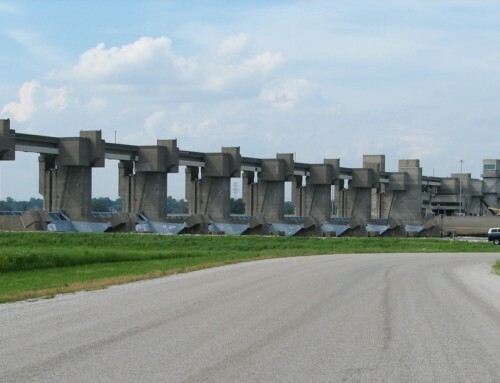 From St. Mary, Missouri, follow Highway 15 across the slough and onto Kaskaskia Island. Follow the signs to the Kaskaskia Bell State Historic Site and Immaculate Conception Church (203 1st St.; 618.615.5747). The bell was a gift to the village from King Louis XV in 1741. It rang out from the church steeple until it was replaced in 1873. Inside the church, there is a display of photographs of the island during the 1993 flood. The church altar dates to the 1730s; it was hand carved out of black walnut and cottonwood native to the region. There are more Kaskaskia-related sites on the other side of the river. The Gothic Court House Museum (1 Taylor St.; 618.826.5000, x112) in Chester has several good exhibits about the old city. Just north of Chester, Fort Kaskaskia State Historic Site (Ellis Grove: 4372 Park Rd. 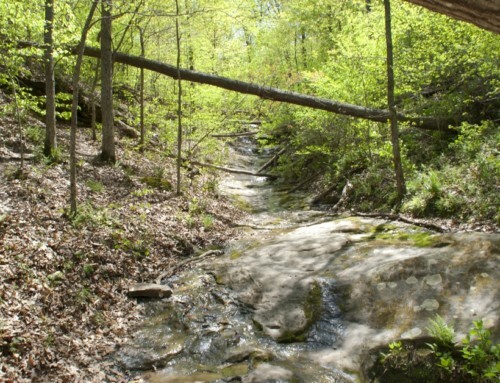 ; 618.859.3741) overlooks the old village site. Immaculate Conception Church (203 1st St.; 618.615.5747) hosts a well-attended community picnic in August. **Kaskaskia is covered in Road Tripping Along the Great River Road, Vol. 1. Click the link above for more. Disclosure: This website may be compensated for linking to other sites or for sales of products we link to. Heading upriver? Check out St. Mary. Heading downriver? Check out Perryville.